Whew -- our last Nobel post of the season! 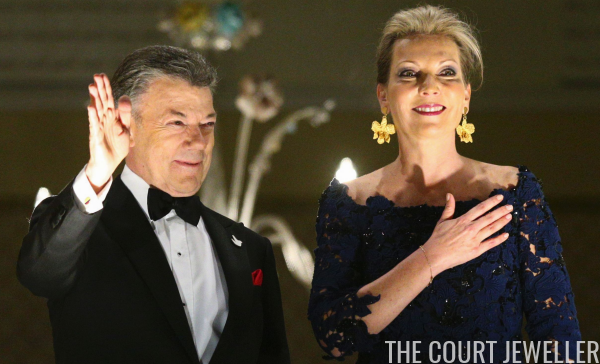 Here's a look at the glittering jewelry worn by the Norwegian royals at the Peace Prize banquet and concert, which honored President Juan Manuel Santos of Colombia. 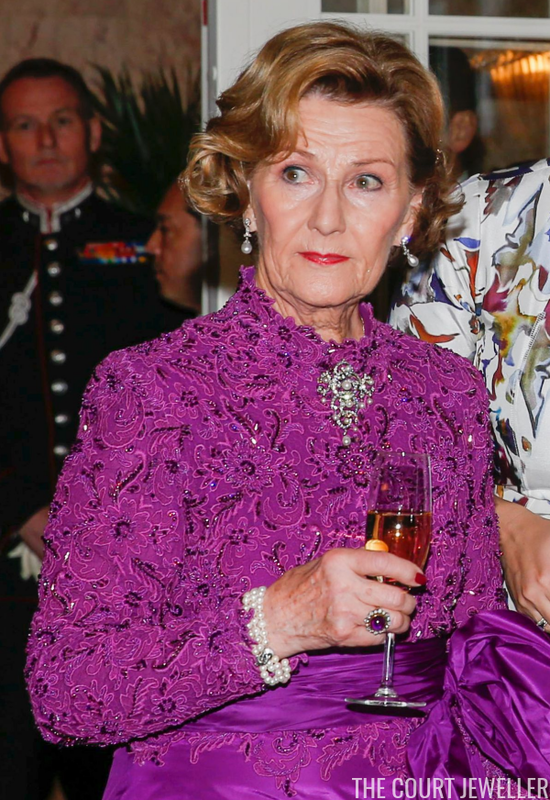 At Saturday evening's black tie banquet, there were no tiaras, but Queen Sonja managed to bring along some major bling anyway. She pinned the Drapers' Company Brooch (one of Queen Maud's wedding presents) at the neckline of her dress, pairing it with diamond and pearl earrings and a diamond and pearl bracelet. She's also wearing a lovely amethyst cluster ring, and she appears to have a brooch fixed in her hair. 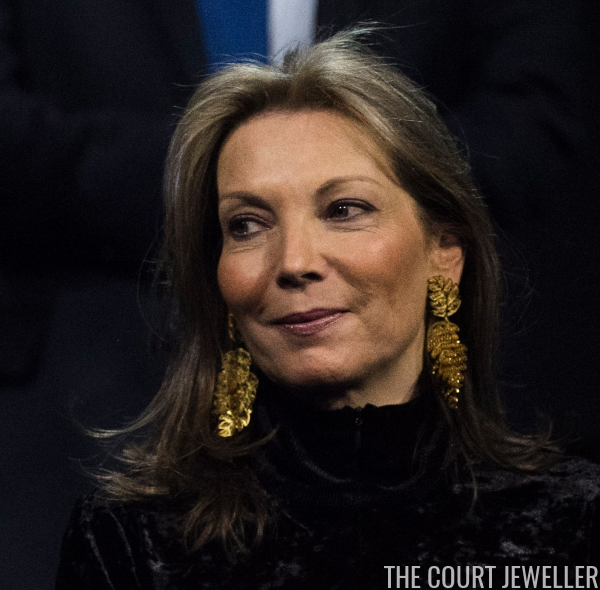 At the torchlight parade on the same night, President Santos's wife, Maria Clemencia Rodriguez, wore a major pair of golden statement earrings. For Sunday's concert, Rodriguez also chose statement earrings, this time in the shape of golden leaves. 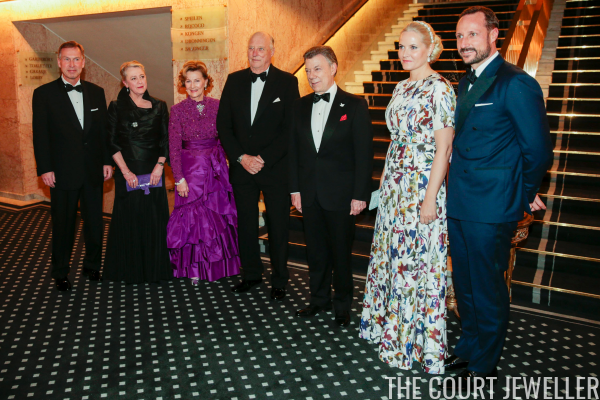 Crown Prince Haakon and Crown Princess Mette-Marit also attended the concert, and Mette-Marit wore diamond and gray pearl earrings with a glittering diamond bracelet.